We try to reward our regulars at Game Day or Game Night by giving something back. 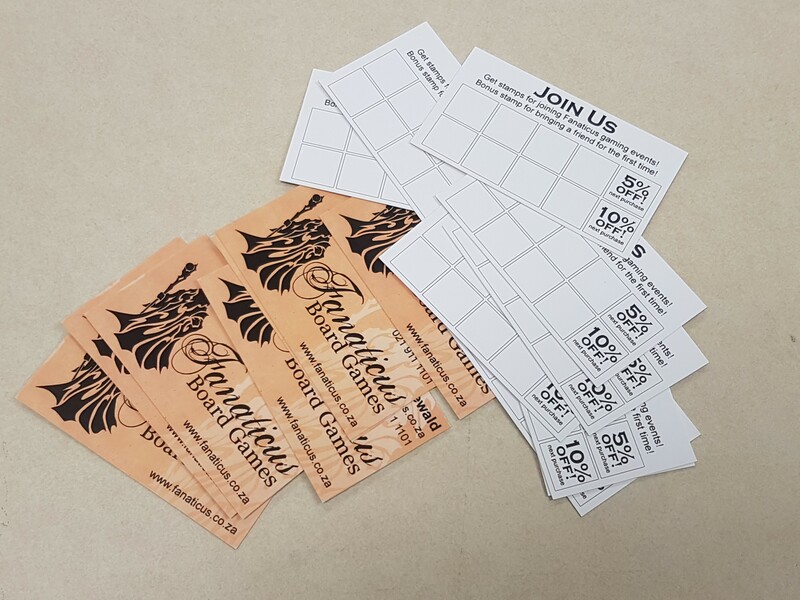 On the back of our business cards is a loyalty card that rewards you for joining our events! Joining any event earns a single stamp. A card with five stamps can be redeemed for 5% discount on any purchase, 10 stamps for 10% discount. On top of this, if you bring a friend for their first time, you earn a bonus stamp! Terms and Conditions: These cards do not combo*, do not stack** and have no cash value. To qualify for a stamp you must join at least one game over the course of your visit and the event. We are not obligated to remain open past normal operating hours. Fanaticus staff have the right to reject any card that appears to be tampered with. ** Only a single card can be used on a single purchase. Stamps from different cards cannot be combined.